2. Burn the non-protected iTunes rentals movie to DVDs. This step by step guide will teach you how to do that, let’s start it. Step1. Download and install this DRM Media Converter, and then lunch it. Click ‘Add’ to located your purchased iTunes movie and import it. You can also drag and drop your iTunes movie into the DRM converter. This DRM Remover supports batch conversion, so you can import multiple iTunes movies or TV shows at a time. Step2. Click the ‘Video file to’ dropdown list, go to ‘Common Video -> AVI‘ and select it. The default setting works pretty well, if you want to custom the video and audio quality. You can click setting to customize the video bitrate, audio bitrate, etc. Step3. Click ‘Start‘, this DRM media converter will remove the DRM protection from iTunes movie or TV shows automatically. After the conversion, click ‘Find target‘ to locate the DRM free iTunes video. Tips: this software can also remove DRM from purchased music, and then you can put iTunes songs on PSP, Zune, Windows Movie Maker, Cell Phone, Blackberry, etc. it also works for other online stores such as Zune, Amazon, etc. Please download and install the iTunes video to DVD burner at first. Launch the iTunes video to DVD burner, you will see the right UI. 2. Choose the “merge” or “batch” tab. 4. (optional) Set your preference. Region “4” in red frames can set the output MPEG properties. 7. 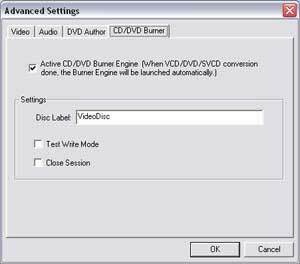 After video conversion done, the “CD/DVD Burning engine” will be launched automatically. Please choose the DVD burner. Done! Now you can enjoy your iTunes movie on DVD player freely.